We have now entered week three as the Wildcats will head home for their yearly FCS game. It’s set to be a beautiful Saturday at Kroger Field with temperatures set to be in the eighties. For the fourth season in a row, UK will be welcoming an Ohio Valley Conference squad into their comfy home confines. This time it will be the Murray State Racers. Mitch Stewart is in his fourth season as the head coach at MSU and it has been tough sledding for the Air Raid disciple. The former Valdosta State quarterback played for Chris Hatcher from 2001-2005, coached under him at Georgia Southern, and then became the wide receivers coach at Murray State. Stewart became the program’s offensive coordinator in 2011 and in 2014, the Racers averaged 327.2 passing yards per game. This success was a big reason why he landed the head gig. Hatcher may have left for the Samford job but his roots are still alive and well at Murray State. He was a graduate assistant and quarterback/wide receivers coach at Kentucky under Hal Mumme from 1997-1999 before taking the head gig at Valdosta State. Since then he’s had a very successful run at the Division II and FCS levels. His Samford club has made two FCS playoff appearances and had Florida State on the ropes last week in Tallahassee. Things didn’t go so well for Hatcher at Murray State, however, as he collected a 27-30 record in five seasons with zero playoff appearances. The Racers haven’t made the postseason since 2002 as this has proven to be one of the roughest jobs in the OVC. Stewart has been given time to rebuild as he was 10-23 after three seasons and is off to a rough start to 2018. The Racers are going with a bit of a youth movement as they try to climb out of the cellar. As far as series history goes, this will be just the second meeting ever between these two clubs. In 2003, Kentucky rolled to a 37-6 victory as Rich Brooks picked up his first win as UK’s head coach. As of right now, there is no line on the game. Look for that to be released on Friday evening or Saturday morning. When addressing the offense of the Racers it all starts with scheme. MSU runs the Air Raid and they do it with tempo. Expect a ton of four wide formations and quick passes as Murray State will try to beat their opponents with precision. This fall, the Racers have a grad transfer running the show. Drew Anderson began his playing career at San Diego State before transferring to junior college and then landing at Buffalo. When UB’s starter, and potential NFL prospect Tyree Jackson, was knocked out of the lineup the Bulls turned to Anderson. He answered the bell. At UB, Anderson threw for 10 touchdowns as he averaged nearly 10 yards per attempt. In just four games, Anderson completed over 60% of his passes and set a program record with 597 passing yards in an seven overtime loss to Western Michigan. He has some serious arm talent. After blowing people away in the MAC, he has struggled to his point with Murray State. For the year, Anderson is barely completing 50% of his passes and is only averaging 5.1 yards per attempt. Much lower numbers then what he put up at Buffalo. After throwing just one interception in four games last season, Anderson has tossed three in just two games in 2018. With any Air Raid offense, wide receivers are going to be key as the Racers will play a lot of them. This is an offense that loves to use screens so look for them to use plenty of those to get their wideouts touches early and often to help eliminate UK’s pass rush. Through the first two games, Anderson has sprayed the ball around the yard as Tyre Gray, James Sappington, and Sylvaughn Turner have combined for 15 grabs. Turner is the most explosive of the bunch as the Alabama native is averaging 17.2 yards per catch. After losing an all-conference receiver from last season, it’s pretty clear that the Racers are still looking for answers outside. On the ground, Murray State is only averaging 71.5 yards per game. D.J. Penick has received the most carries but is only averaging only three yards per attempt. Rodney Castille is listed as a wideout but Murray State will use him as a running back. All of the backs for the Racers are under 190 pounds so it is hard for them to move the pile. Don’t expect too many rushing attempts on Saturday. There’s been a lot of inefficiencies for this offense early in the season but the biggest one just may be its production in the red zone. For the season, the Racers have had six possessions inside the 20 and have only come away with one touchdown. The scheme has proven to be effective under Mitch Stewart but the personnel just does not appear to be there for the Racers. Drew Anderson has a ton of potential and a proven track record but he is just not getting the required help from his supporting staff. For the season, the Racers are giving up 219 yards per game on the ground and 7.3 yards per attempt on passes. These numbers are suboptimal. Opponents are converting 49% of their attempts on third down and UK enters this contest hitting on 61.5% of their third downs. It’s going to take a very spirited effort for the Racers to stop Benny Snell and the Wildcats. It starts with linebacker Quincy Williams who has collected 21 tackles in just two games. The redshirt senior from Birmingham is thick (5-foot-10, 239 pounds) but packs an impressive punch. On the year he has a couple tackles for loss included a sack and a forced fumble. He is this group’s best player. Playing next to Williams at linebacker will be Missouri transfer T.J. Warren and former Washington State linebacker Kendrick Catis. The two have combined for 28 tackles on the year. Catis has been very active with two non-sack tackles for loss and a pass break-up. There are former Power Five players sprinkled all throughout the roster. The most important player happens to be on the line of scrimmage as defensive end Kenney Wooten is back for his senior year after posting 10 sacks last season. So far in 2018, the junior college transfer has a sack, an interception, and a blocked kick in just two games. He’s an impact player on the line. Much like the offense, Murray State’s defense has also really struggled in the red zone. Opponents have scored six touchdowns in eight possessions and this is a big reason why the Racers are giving up nearly 40 points per game. Even though the rushing numbers are large, the Murray State run defense hasn’t been as bad as you might think as opponents are only averaging 4.1 yards per carry. The biggest issue for this group has been amount of plays. The defense has been on the field for 37 more snaps than the offense in just eight quarters. The season is early but Gabriel Vincente has been a reliable placekicker for the Racers. The former FIU Panther is 3-for-3 on field goals and 2-for-2 on extra points. His long on the season was from 39 yards out. Last year he hit 12-of-14 attempts with a long from 52 yards. He’s a good one. Steve Dawson has gotten a lot of work as the team’s starting punter as he has 15 attempts to this point. Murray State, just like Kentucky, headed over to Australia to land their punter and Dawson was a rugby player before transitioning to the gridiron. He is averaging just shy of 40 yards per kick but has had seven fair caught, four inside the 20, and two punts that traveled over 50 yards. Much like Vincente, he’s a quality specialist. There is not much to speak about in the return department but Murray State has a field flipper at punter and a kicker with legit 50-yard distance. Keep this in mind if this becomes any type of field position game. With any Air Raid offense, you’re going to go with how quick and accurate your quarterback can be when distributing. For Murray State, this is a grad transfer who is still adjusting to the new scheme. Drew Anderson has prototypical size for a quarterback and a quick release to go along with it. He moves around well in the pocket and has a really big arm. He can stretch the field vertically about as well as any other quarterback UK will face this season. He’s off to a slow start but once he gets accustomed fully to Stewart’s Air Raid and builds a rapport with his wideouts the numbers will start to improve. The ground game is just not there for the Racers so there are going to be a lot of games where Anderson approaches 50 pass attempts. If they can protect him, expect the California native to throw the ball all afternoon at Kroger Field. In the last three seasons, we have seen Kentucky really struggle with their FCS opponents as each entered the second quarter with a lead over the Wildcats. In media sessions this week, the coaches have spoken about keeping the starters focused and that’s exactly what they need to do. 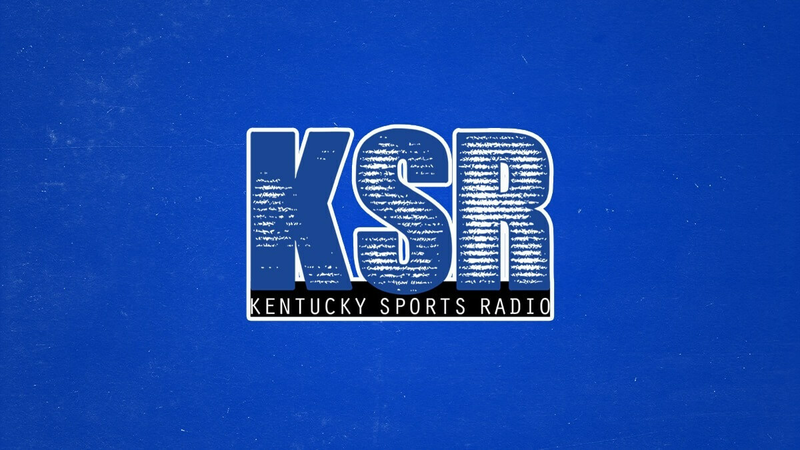 The Wildcats must take care of business early so they can get some youngsters some much needed reps.
For the season, Kentucky’s outside receivers (Josh Ali, Dorian Baker, Isaiah Epps, Tavin Richardson) have combined for 10 targets and only three receptions in the first two games. The offense has done some really good things but the passing game desperately needs these guys producing. Look for Gran to try and get them involved early. Defensively, UK must not let Murray State get off to a fast start. Each other FCS offense UK has faced in the last three years has gained confidence from early success against the UK defense. Prove this group is different and get stops early. All training camp, we heard about the impact true freshmen wideouts Allen Dailey, Jr. and Akeem Hayes were making. Neither have played but we should see each on Saturday. Highly touted transfer Ahmad Wagner should be making his debut at wide receiver. If UK can put away Murray State, Gunnar Hoak could have some interesting wide receivers to target in the second half. After not getting any takeaways in the first seven quarters of the season, Kentucky came away with two in the fourth quarter against Florida and each happened on the opponent’s side of the field. The Cats got a defensive touchdown to close the game and that should be a good omen moving forward. Against inferior competition, Kentucky needs to keep it rolling. Once the competition stiffens, creating turnovers will be an important part of this team’s winning formula. After not having an attempt to this point in the season, it would be good to see Miles Butler try a field goal. The former walk-on has been solid on his extra points but he needs some game experience on field goals. Kentucky is going to need him as they get into the meat and potatoes of the SEC slate. You think Kentucky loves checkerboards, huh? Well you haven’t seen what Murray State does in home games at Stewart Stadium whenever they score a touchdown. Murray State’s mascot was originally a thoroughbred before switching to Racers in the 1950s. In honor of that, MSU gets a thoroughbred named Racer One to run around the track after touchdown in you guessed it…a face mask with checkerboards. Kentucky isn’t the only one in the state sporting the trend. The original Racer One is buried inside the stadium on MSU’s campus. This is a tradition that has been going on since 1976. This team probably couldnt beat DeSales, Trinity, or Male. CAYTS BY 90!